We visited the ancient site of Nemea on the same day as our excursion to Mycenae. I was all photo-ed out by this point, but I still managed to grab a view for you intrepid followers. 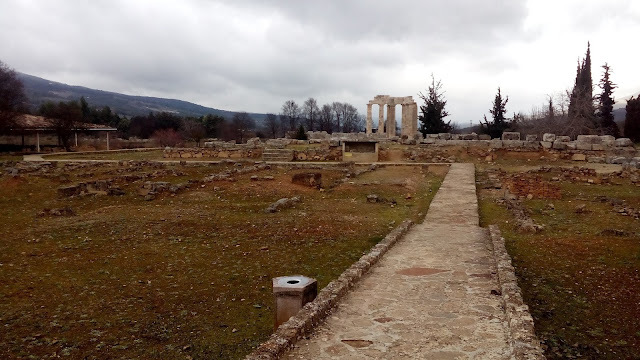 Nemea, which definitely sounds biblical, is the mythological site where Hercules slayed a lion, or some crap like that. According to historical records that don't mislead you into thinking that Greek mythological figures were actual ruling kings of Mycenae, Nemea was a site for the Panhellenic Games. One of the other sites, as I'm sure you'll remember, was Delphi. 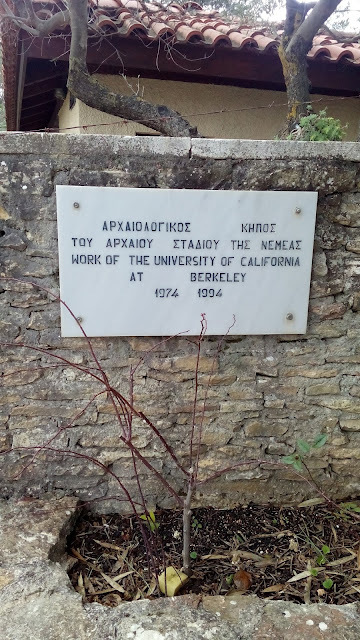 UC Berkeley has really led the charge on excavating and restoring Nemea. I wanted to post this particular photo for my Cal relatives to show them what their alumni support is doing overseas. Something you should know about Berkeley is that they rejected both Phil and me from their graduate school programs. We will never forgive, and we will never forget. Here's the old site of the games. We were the only ones there. We might have been the only ones who visited all day. The lady in the ticket booth was really pleased to see us. 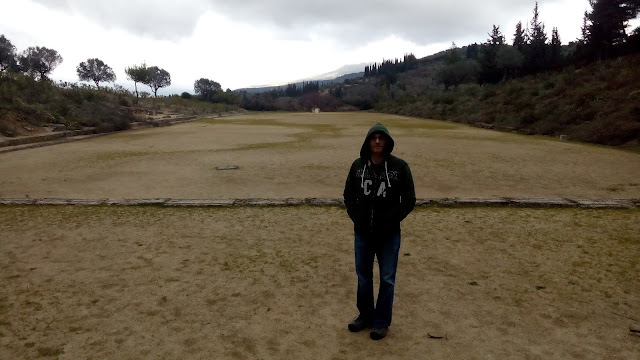 Shortly after we left the second Nemea site, it started snowing. It's really, really nice to see all these sites during the off season. This tunnel brought the athletes from the locker rooms to the stadium. In the early 2000s, a big chunk of the tunnel's ceiling fell down. 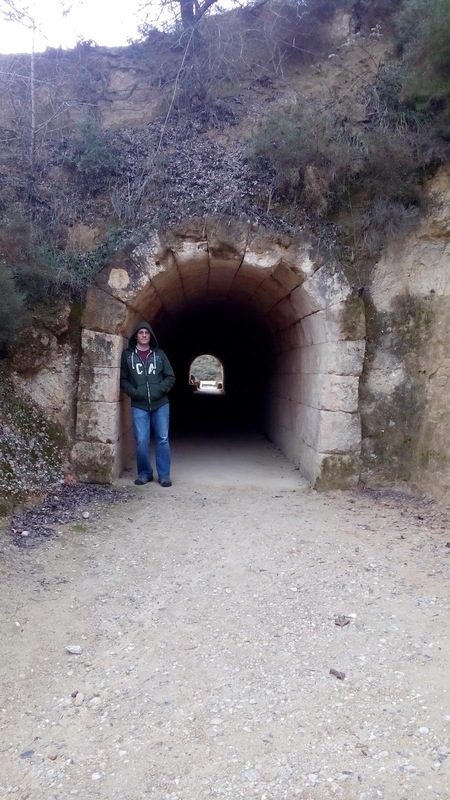 Fortunately, there was no one in the tunnel at the time, so they shut it down for a few years to restore the whole thing. Phil and I did not know about the ceiling falling until we were reading the magazine the ticket lady gave us on our way out of the site. We sauntered through this tunnel slowly. Here's the stadium! I'm about 70% sure that Phil is standing in front of the starting line. I don't want to make a declarative statement, because there's a chance that some of you might actually end up seeing this for yourselves, and I really hate being wrong. There were no seats found at this stadium. It's thought that the spectators sat on the hill to watch. There is a judges' bench. You can somewhat make it out about halfway down the stadium on the left-hand side. Right after I took this picture, Phil and I ran to the finish line. It was very painful. 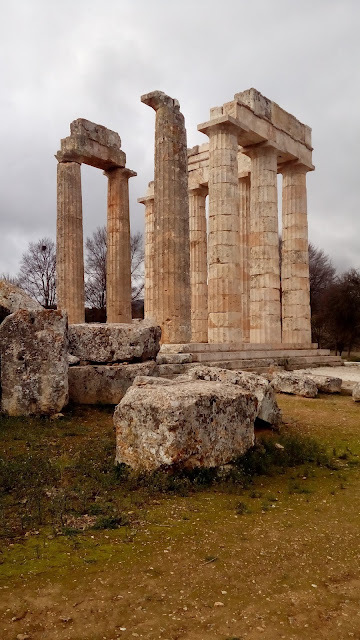 Down the road from the old stadium is the Temple of Zeus (those sad-looking columns in the distance). It was used in connection with the games. There's an ancient bathhouse off to the left of the temple. In front of the temple is a little box structure thing with an ancient skeleton inside. I wonder how I'd feel about my bones being on display like that. This is the Temple of Zeus up close. It's much more impressive from this angle. The three dirty columns on the left were the only ones that were standing when Berkeley came to town. 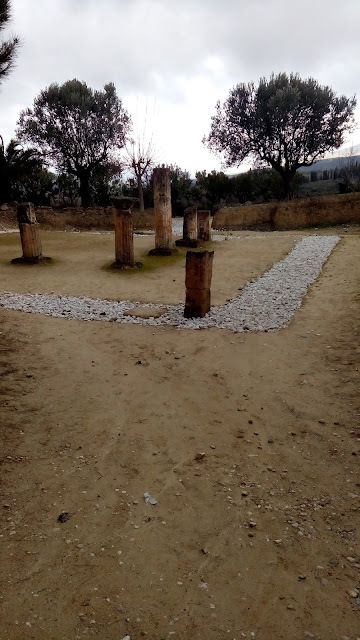 Sometime around the low-hundred BCs, someone decided they'd had enough of pagan stuff, and started to tear down this temple. The big boulders in front of it are actually more column pieces. It's like a column graveyard there. Berkeley has gone through and tagged all the stones. They hope to erect more columns in the future, like they've done with the pretty-looking columns standing to the right. If they had admitted us to their grad school programs, we'd probably feel proud of them for their work. Nemea: 4 euros gets you a ticket into both sites, though you can buy a single ticket to each. There's not a lot to see at either beyond what's in these photos, but if you're in the area already, it might be worth a look. You can see the temple from the road. You can't see the old stadium unless you pay to get in.